My favorite read this year. Playful and soulful. Daumal died before he finished it, so it ends in mid-sentence, which is itself a perfect analogy of the accessible yet impossible Mt. 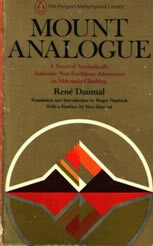 Analogue that is at the center of the book. An engaging novel about language, society, the overlooked, and so much more. Almost no plot to speak of, this novel sounds academic, but is actually a riot to read. The story ‘Stray Horse’ alone makes this one of the best books ever. The inner-life of objects, memory, and the battle between versions of the self slowly sprawls itself across this long meandering story. What a delight. What I loved most about this book is that it showed me the real world in a magical way. It’s not magical realism, it’s just a magical perspective. I felt like a kid again. A long poem written over the course of one day, this book hijacked my own thought patterns and made me live under the haze of its strange continuous rhythms of mundanities and insights. Awesome. Re-reading this has been an eye opening experience on how much I missed the first time through (in my 20s), and how much more emotionally close to home these people’s lives and stories are now. I was totally blown away and need to revisit all of Woolf’s catalog now. Philosophy written as a form of poetry, using the poetic image as a reverberating medium, Bachelard attempts to examine our deepest associations to those most intimate and secret spaces we’ve created in our imaginations. One of the most quotable books I’ve ever read. I have longer reviews of these books and many other ones on Goodreads.